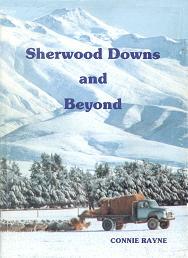 P 80-82, Sherwood Downs and Beyond, written by Connie Rayne of Oamaru, New Zealand in 1991. Section 5 + 5a - 1,664 Acres. Situated at the top end of Butler's road. Purchase price £3,990 with 49 applicants. William and Caroline Howes arrived in Timaru on an early settlers' ship. A small farm was purchased next door to the Te Moana School (near Geraldine) where their family of eight children were brought up. On retirement they settled at Tahana, Nelson where William built his retirement home. Their son, Christopher, now 21 years old, had been employed on thrashing mills and shearing. With brother James he decided to put their names forward for a ballot holding on Sherwood Downs. James name came up with success. They therefore formed a partnership of Howes Brothers. On arriving at Sherwood Downs at their holding, they realized the reality of their decisions as they viewed the scene from their newly acquired land at the top end of Butlers Road, and with the crisp feeling of Autumn in the air, and the starkness of their surroundings, first thoughts being for the two bachelors, was some form of shelter. A small cottage was duly built, with help also from Chris's father James, and brother Victor, who later farmed at Albury, the timber being carted from Fairlie, by horse and cart. At first, a team of horses were bought and 800 sheep. By 1920 the highest number of stock run was 1,223. Like most holdings six cows were milked to bring some cash to the household. A very good orchard was also established, these fruit trees being planet by Chris, and James' their parents, also had a good orchard at Tahana, Nelson. On a visit to see Chris at his home in Christchurch, at Easter 1975, although in his 87th year (passed away at 90 years in 1977 - Louise 1987 -86 years) it was with great pleasure that I was given the opportunity to spend time with this fine gentleman, even though he was not well at the time. On mentioning Sherwood Downs, his eyes lit up as he vividly recalled experiencing his first encounter with the full and unrelenting force of our Nor'West winds early in 1913. On this particular night, Chris had to prop up their home. The next morning, with no sign of the wind abating watched in horror as black clouds of dust could be seen as far as Fairlie. This gale was the worst he could remember in his 16 years at Sherwood Downs. As frail as Chris was, he took my pen and paper and dew out a map of the boundary fences and creaks, well remembering their names too. In 1914 when the first World War broke out, Chris, was enlisted with the South Canterbury Mounted Rifles, serving his country for the next four years, at Gallipoli, where he received injury from shells. Later he served in Egypt and Palestine. On his return, Chris found brother James had carried on the farming activities to the best of his ability, having suffered with polio, which left him disabled. Shortly afterwards the partnership was dissolved; James return to live in Nelson, later spending the rest of his single life near his sisters in the North Island and passed away in 1960 in Nelson. Chris's sister May, and brother-in-law John Rowan, lived at the Howes property with their five children; James, John, Jessie, Christie and Robert Vincent, who, from 1920-1924 attended the Sherwood Downs School during that period. John assisted with the farm work and was the Rural Mail Contractor for Sherwood Downs. In the 1920s Chris made a yearly visit to his parents in Nelson, this being a three to four day trip from Sherwood Downs in those days. The route was taken from Fairlie to Timaru by train, another train journey to Christchurch, then the boat crossing from Lyttleton to Wellington, then Nelson. Next door to his parents lived the Hingston family, where with gentle persuasion and much match making by both parents, love blossomed for Chris and Sarah Louise (Lou) Hingston, their marriage taking place in 1926. Lou 26 years of age, Chris 39 years of age. For the next two years Lou Howes found it a harsh and lonely life at Sherwood Downs, missing her parents and family dreadfully, and never contemplating the winters could be so cold after the warmer climate of Nelson. She also had to deal with a coal range, a tank with outside tap, and no internal plumbing and Spartan conveniences. When baby Joyce arrived in the winter of 1927, like so many of the women of Sherwood, Lou had to bath baby and wash nappies in the baby's bath, in front of the open fire. The nappies hung frozen on the clothes line (NO electric clothes driers for those mothers), before being put on the rack on top of the coal range of the familiar clothes rack suspended from the ceiling. Chris and Lou only stayed two years of their married life at Sherwood Downs. The climatic conditions and depressed prices for the wool clip, low returns for sheep and lambs all added to their decision in 1928 to give up farming. Chris told me, he very much regretted his move as finance owing to him at Sherwood Downs was never repaid and it was finally wiped as so may mortgages were in those days. Chris had purchased a Ford car which was also left on the property when he left in 1928. In the February of 1928 Jim Simmers of Fairlie recalled helping Chris with his last harvest. Chris and Lou purchased a small property back in the warmer environment of Hope, Nelson, where a market garden was established. Three more children were born, Peter, Graeme, and Beth, Chris and Lou after many years in Nelson, retired to Geraldine, then to Timaru, Christchurch, and finally back to Nelson. But their sons, Peter and Graeme, became very well known names throughout South Canterbury and New Zealand as leading cyclists, both Peter and Graeme winning championships at New Zealand cycle meetings. Peter was for many years, President of the Timaru Amateur Cycling Club, his wife Mary, as Secretary. Chris and Lou's grandsons, have carried on the tradition, Graeme and Wayne Howes, from teenagers up to the present time continue their participation with marked success at the Timaru Club. Peter was in partnership with Alan Loach as "Loach - Howes Cycles" in Stafford Street, Timaru, until he was tragically killed in a road accident at Timaru in July, 1970. Sister Joyce also passed away suddenly in 1962 in Nelson. Their youngest sister Beth and husband Tony Le Cren, now have Bealey Lodge in Christchurch, and Tony works as a voluntary counselor for Radio Rhema. Beth told me her father had a great love for South Canterbury and would love the trip to Sherwood Downs, and Te Moana to reminisce on the early days. He also enjoyed coming back to help his older brother, Victor, at Te Ngawai, Albury, for the shearing (who purchased his property in 1919). Like so many others in the early era, and very sadly today, financial pressures, hardship, and stress, with surviving the harsh rigours of early farming, forced him to leave the land. It was for her parents a very sad time, but her father, was not one to be defeated, he was a iremendously hard worker, who had a philosophical approach to life. He always paid cash and never owed anyone for good, he had been bought up in a tough, hard environment but family love was strong, Loyalty, love and kindness were family traits; wordly goods were very unimportant. He, being a generous loving husband and father, gave his children a better legacy than anything else, instilling in his family, an independent attitude that nothing succeeds without continued hard work and effort. We always continue to thank our parents for giving us a good righteous heritage which we have been able to pass on to our children because of them. While working in the Fairlie Craft shop one hot nor'west day in January 1990, a weary traveler who had just returned from the Mackenzie County for a day trip, entered the shop. On enquiring where she was staying she said "With relatives, the Howes at Albury". Immediately I asked "Were you related to the Sherwood Downs Howes family? ", "yes, I stayed with my Uncle Chris and attended Sherwood Downs School", I couldn't believe my good luck, and really enjoyed our conversation. On looking up the old school roll, there it was, Esther Mary Howes, attended Sherwood Downs School for 10 days in February 1926. Even her daughter who was accompanying her said "You never told me that Mum." She is now Mrs Esther Marriott, Palmerston North. April 1928. Next owner was Neville Sherlock Graham. At the time of the sale - 1,265 sheep, 5 horses, and 5 head of cattle, 1 pony, implements and Chris Howes Ford Car, were left. Total £5, 800.